You are Go for FPGA! Reconfigure.io is accepting beta applications for its environment to configure FPGAs using Go. Yes, Go is a programming language, but the software converts code into FPGA constructs, so you don’t need Verilog or VHDL. Since Go supports concurrent routines and channels for synchronization and communications, the parallel nature of the FPGA should fit well. According to the project’s website, the tool also allows you to reconfigure the FPGA on the fly using a cloud-based build and deploy system. There isn’t much detail yet, unless you get accepted for the alpha. They claim they’ll give priority to the most interesting use cases, so pitching your blinking LED project probably isn’t going to cut it. There is a bit more detail, however, on their GitHub site. Robotic control can get very complicated when multiple actuators need to work in coordination with each other. A simple robotic arm will require each joint to be controlled in sequence to attain a particular position. The BeagleBone Blue comes armed with motor drivers, sensor inputs, and wireless and is built for robotics. [Andy] has prepared a musical robot called the BeagleBone Blue Electro-Mechanical Glockenspiel using the single board computer. The hardware consists of eight servo motors each with a mallet stick attached to them. The motors themselves are mounted on 3D-printed brackets allowing them to be mounted at the correct height. The servos connect to the main board for position control, however, an external supply had to be used to supply the necessary current to all the motors. The software side has programs to translate notes into servo positions as well as connect to a web brower via MQTT and websockets. The basic user interface is simple and has buttons to connect to and send the keystrokes. The code, as well as the OpenSCAD designs, can be downloaded from GitHub. Check out the video below for a demo. This project by [blackfish] shows off a cardboard lookalike of an MP5 that loads from a working magazine, has a functional charging handle, and flings paper projectiles with at least enough accuracy to plink some red party cups. It was made entirely from corrugated cardboard, paper, rubber bands, and toothpicks. In the video (embedded below) you can see some clever construction techniques. For example, using a cyanoacrylate adhesive to saturate areas of wood, cardboard, or paper to give them added strength and rigidity. The video is well-edited and worth a watch to see the whole process; [blackfish] even uses a peeled piece of cardboard — exposing the corrugated part — as a set of detents (6:56) to retain the magazine. Smart lighting is all the rage right now. Sure, Phillips Hue is the giant player in the market, but there are plenty of ZigBee, Bluetooth, and WiFi light bulbs out there. Ikea–known for cheap furniture, meatballs, and waffles–is a recent addition to the field with their Tradfri system. Like most things from Ikea, they are effective and inexpensive. [Andreas] takes a Dremel to the controller and shows how to hack the system to use MQTT. You can check out the video below. Once he had the device opened, the used the German Make magazine article we talked about earlier, to help understand what he had. Armed with the pinout, he was able to solder a wiring harness to the controller. He then connected a WeMos board. A little Arduino code later, and he was controlling the light with MQTT. Trail and wildlife cameras are commonly available nowadays, but the Wild Eye project aims to go beyond simply taking digital snapshots of critters. [Brenda Armour] uses a Raspberry Pi to not only take photos of wildlife who wander into the camera’s field of view, but to also automatically identify and categorize the animals seen using a visual recognition API from IBM via the Node-RED infrastructure. The result is a system that captures an image when motion is detected, sends the image to the visual recognition API, and attempts to identify any wildlife based on the returned data. The visual recognition isn’t flawless, but a recent proof of concept shows promising results with crows, a cat, and a dog having been successfully identified. Perhaps when the project is ready to move deeper into the woods, elements from these solar-powered networked birdhouses (which also use the Raspberry Pi) could help cut some cords. Hackaday is all about the neat hacks and the repurposing of old components into new projects, but many people then try to take those projects and turn them into businesses. We’ve seen lots of people offer their stuff as kits and sell them on Tindie, with the rare few going on to develop a consumer electronic product at scale. The Hackaday Prize 2017 Best Product highlights this journey. “Scale” itself is a vague term, but essentially it means to be able to produce enough to meet market demand. We hope that market demand is roughly 7 billion units, purchasing yearly, but the reality is that it is somewhere between 1 and a few hundred thousand, with very big differences in manufacturing at each order of magnitude. So how do you start with a proof of concept and design your product from the very beginning to be optimized to scale to meet whatever demand you can handle? For one reason or another, Hackaday has an extended family of ridiculously capable contributors. One of the most illustrious is [Bil Herd], Commodore refugee, electronic engineer, medic, and all-around awesome guy. 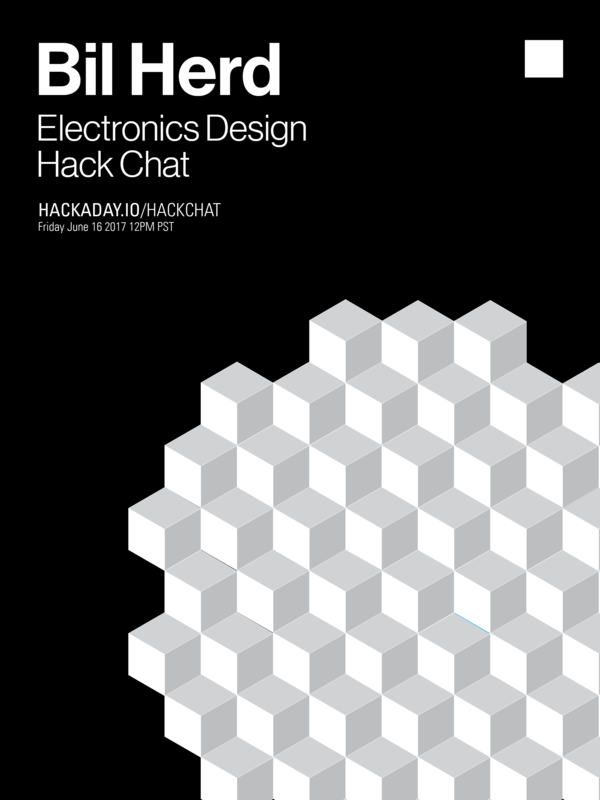 He’ll be joining us over on Hackaday.io this Friday for a Hack Chat on Electronics Design. This Friday, we’re hosting a Hack Chat with [Bil]. If you want to talk Commodore, this is the guy. If you want to talk about PLAs and programmable digital logic, this is the guy. If you want to know how to build a system from scratch in just a few months, [Bil]’s your man. [Bil] has decades of experience and his design work was produced by the millions. You’ll rarely come across someone with as much experience, and he’ll be in our Hack Chat this Friday. [Bil] has a long career in electronics design, beginning with fixing CB radios and televisions back when fixing TVs was still a thing. Eventually, he worked his way up the engineering ladder at Commodore Business Machines where he designed the Commodore TED machines and the amazing Commodore 128. After surviving Commodore, [Bil] has worked at a trauma center in Camden, NJ, flown with medics in the Army, and eventually came over to Hackaday where he produces videos from subjects ranging from direct digital synthesis, programmable logic, active filters, and how CMOS actually works. Basically, if it involves electronics, [Bil] knows what’s up. Oh, as an added bonus, we get to name a puppy this week. [Bil] got a new puppy and it needs a name. Send in your suggestions! Our Hack Chats are live community events on the Hackaday.io Hack Chat group messaging. This hack chat will take place at noon Pacific time on Friday, June 16th. Confused about where and when ‘noon’ is? Here’s a time and date converter!